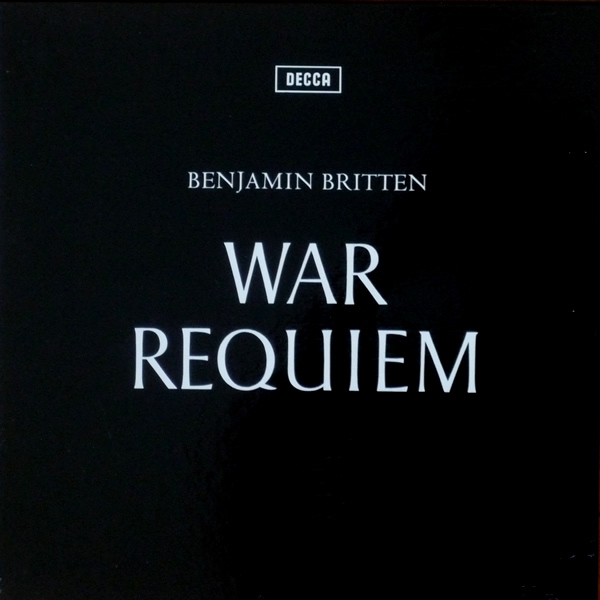 In 1962, the renowned British composer Benjamin Britten presented the world with his War Requiem – a bitter, sombre setting of war poems by Wilfred Owen alongside the text of the Requiem Mass. 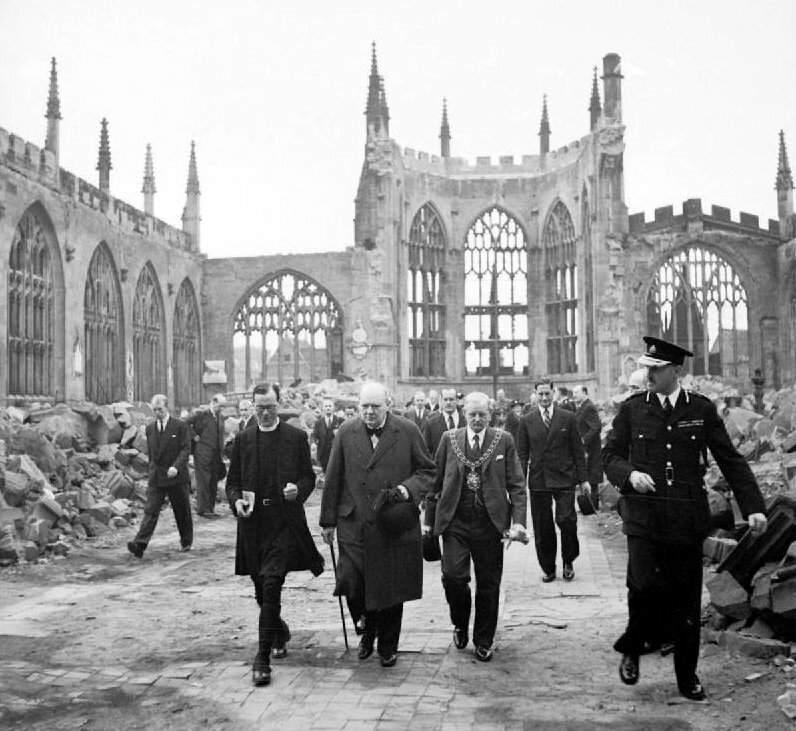 The piece had been commissioned to celebrate the consecration of Coventry’s new cathedral, following its predecessor’s complete destruction in the Blitz. The premiere performance ultimately involved three conductors, two orchestras, and two choirs, and had been intended to combine soloists from Germany, England and Russia, symbolising a final concord between the formerly-combatant nations. Unfortunately – and somewhat ironically – the Soviet authorities revoked Russian soprano Galina Vishnevskaya’s permission to participate at the final moment, for political reasons. Despite the Requiem’s being utterly embedded in the aftermath of what was universally perceived as a far greater and more terrible conflict, Britten turned to the pity and horror of Owen’s Great War poetry for his first major musical engagement with the theme of war – although he had briefly entertained the notion of composing an artistic apology to the people of Hiroshima during the late 1940s. Previously, Britten’s conscientious objection, his self-imposed wartime exile in the United States, and his general anti-war attitude had left him, at best, on the fringes of the British establishment. Now, however, with the Cold War hotting up, and CND the campaign of the moment, here at last was a socially and politically acceptable public vehicle for the composer’s pacifist conscience. For Britten himself, the War Requiem represented ‘an attempt to modify or adjust the wrongs…or the pains of the world with some dream, with some aesthetic kind of object.’* It was a form of reparation, dedicated to friends who had died in the conflict, yet it was also a conscious attempt to change popular perceptions of the 1914-18 war. The composer would undoubtedly have been gratified to learn how many performances of the Requiem have already been staged worldwide to celebrate the centenary of that war’s initial conflagration. Today, however, with the First World War gradually receding beyond the realm of living memory, a new form of aestheticisation and mythologisation of the conflict is afoot in British culture – a process tellingly outlined in the final chapters of David Reynolds’ The Long Shadow: The Great War and the Twentieth Century (2014). While Owen knew the horrors whereof he wrote, having had to stare gruesome death in the face countless times, and while Britten was struggling with his own tortured conscience, and the knowledge that, had the Second World War not been fought, he could have expected little quarter as a homosexual in Nazi-occupied Britain, a new artistic generation who have never experienced war or its privations can regard the conflict with more equanimity. World War I may be the preserve of their grandparents or great-grandparents, but, ultimately, it has become a symbol of national identity and cultural heritage, a historical topos with the power to move, but no longer to cause utter despair. 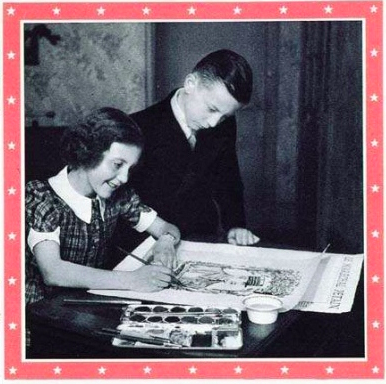 Stark contrasts – the sombre cover of the first recording of Britten’s War Requiem (1963), and the bright, childlike illustrations accompanying Carol Ann Duffy’s The Christmas Truce (2011). This new mode of artistic reflection in comparative tranquility is well-exemplified by a new work for chorus and orchestra by composer Oliver Rudland, setting Poet Laureate Carol Ann Duffy’s poem The Christmas Truce, which will receive its premiere at St John’s Smith Square, London, on 6 December 2015. Duffy’s poem describes the legendary impromptu ceasefire of Christmas Eve 1914, when German and British soldiers alike suspended hostilities, and began to forge bonds of mutual respect and affection (or at least cordiality) through shared carol-singing and joint football matches. Momentarily, at least, a quick end to the slaughter had seemed possible. Presented as a fable in verse, complete with touchingly childlike illustrations by David Roberts, the poem turns this historical episode into a sort of pacifist fairy-tale for our times. Heartrending though Duffy’s beautifully-crafted language can be, her depictions of ‘barbed wire, strange tinsel’ or ‘a rat on the glove of a corpse’ are distanced, anaesthetised from the true horror that Owen and his companions knew only too well. 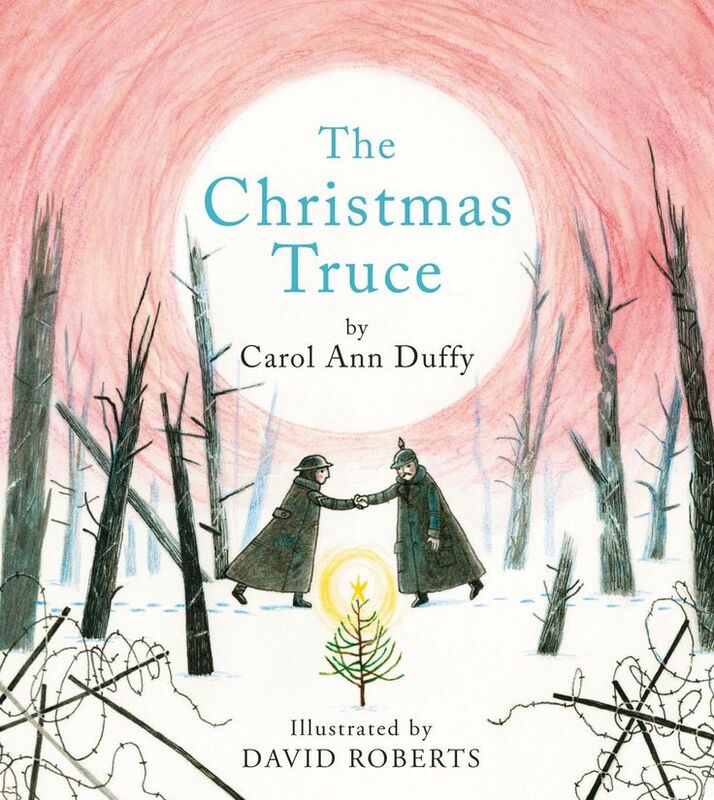 This impression is also heightened by the fact that The Christmas Truce is published as part of a series alongside Duffy’s other seasonal poems, respectively entitled Mrs Scrooge and Another Night before Christmas – which are featured on the little volume’s endpapers. Thus, ‘the yawn of History’ which Duffy invokes on the final page of her narration is almost in danger of subsuming the war into a cloying sweetness – of kitsch, rather than decomposition. Rudland’s musical adaptation takes full advantage of Duffy’s poetic celebration of the soldiers’ singing – the catalyst which returns them to humanity – incorporating old favourites such as ’Silent Night’ and ’The First Noel’ in an entirely novel setting. In terms of its scale and artistic ambition, Rudland’s work could be termed a War Requiem in miniature – a 20-minute dramatic cantata for choir and chamber orchestra, with the narrator as soloist. Yet this is also a fresh interpretation of the Great War for a new century (or even millennium), not jaundiced by any personal experience of war, or the guilt that avoiding war can bring. Rather, it orchestrates Duffy’s fable in a way that encapsulates both horror and fragile hope, capturing the strange lunar beauty of the frostlit mudscape of the Western Front – yet also celebrating the joy of that camaraderie which can arise among us, even in the most desperate of circumstances. The first movement of Oliver Rudland’s setting of Carol Ann Duffy’s ‘The Christmas Truce’ will be premiered by the London Choral Sinfonia, directed by Michael Waldron, at St John’s Smith Square, London, at 7.30pm on Sunday 6 December 2015. The programme will also include Benjamin Britten’s cantata ‘St Nicolas’ and a selection of carols and other festive music. * Quotations are taken from Paul Kildea’s biography, Benjamin Britten: A Life in the Twentieth Century (London: Penguin, 2013). Humorous examples of Chinesified English – Chinglish – have recently become a global phenomenon, and the inimitable Miles Kington popularised mangled mixtures of French and English in his hugely popular Let’s parler Franglais series. However, unfortunate fusions of German (Deutsch) and English – i.e. 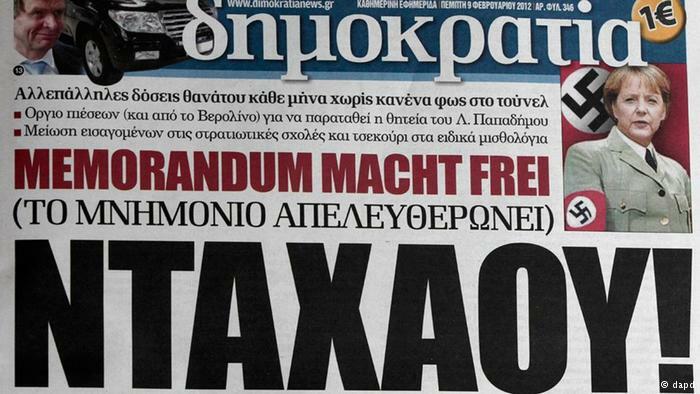 Denglisch – haven’t yet become quite as well-known. 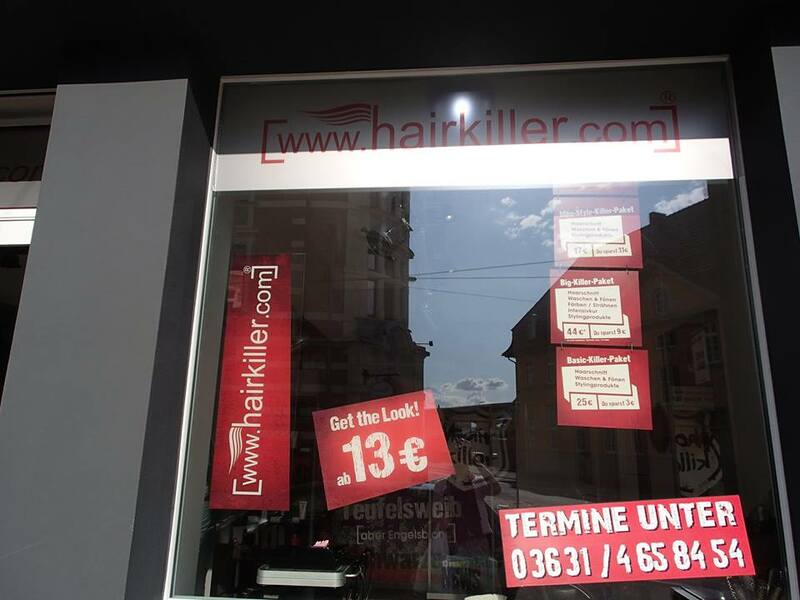 Curious Denglisch #1: Would you trust this coiffeur with your lovely locks? 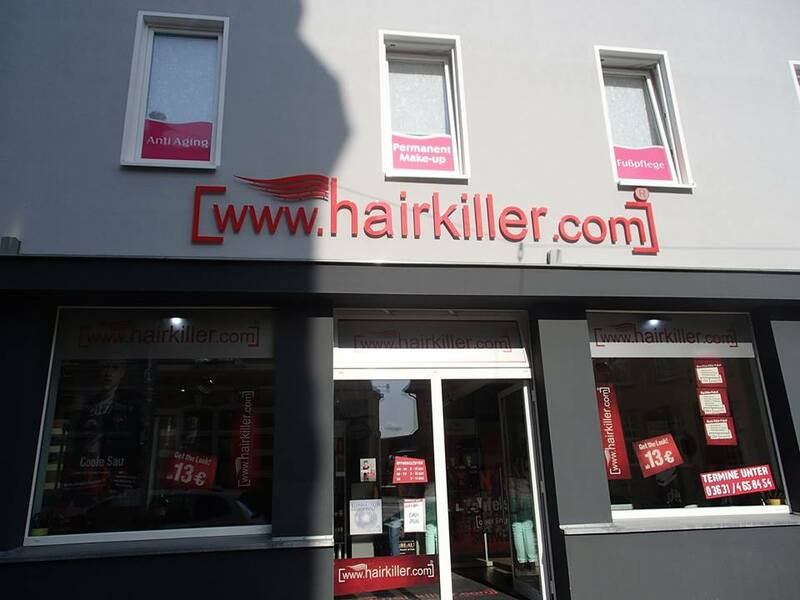 Respectively, the signs in the window are advertising the “Men-Style-Killer-Paket”, the “Big-Killer-Paket”, and the “Basic-Killer-Paket”… Enough said? 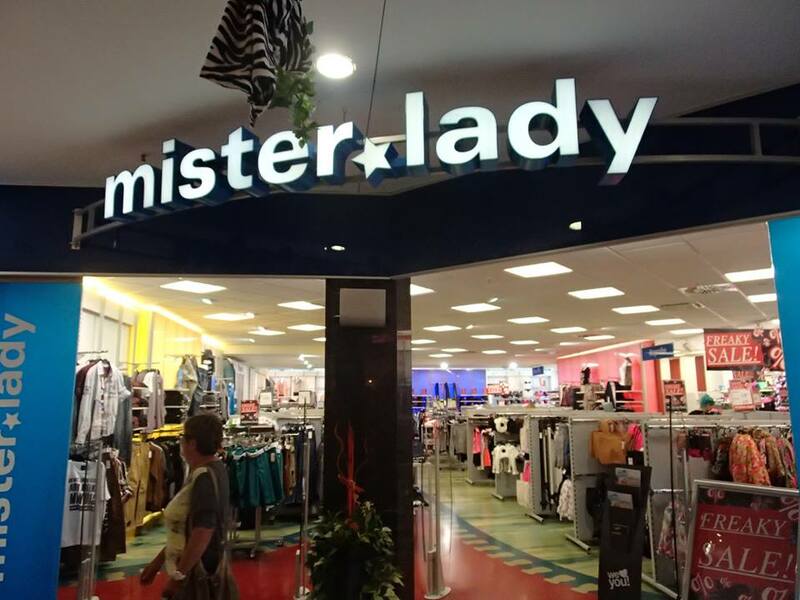 Curious Denglisch #2: The interestingly-named clothes shop, “mister lady”, advertising a “Freaky Sale”, Bahnhofstraße, Nordhausen. A few days ago, I happened to be working through a seemingly innocuous file from the German Interior Ministry during the mid-1930s, collated by one Hans Pfundtner, who was a Staatssekretär (a very high-ranking civil servant) in the Ministry. It contains a series of letters to (and about) Pfundtner’s son Reinhard, who has just been sent to a Napola, one of the Nazi elite-schools which I’ve been researching for the last few years. There are also some odd moments of humour – for example, the father’s keenness on huntin’, shootin’ and fishin’, such that he won’t even be home to welcome his son at Easter because he will be off hunting capercaillies instead…! And yet… as we read through the file, small intimations of Pfundtner’s engagement with the Nazi regime begin to mount up – enough to give us pause. 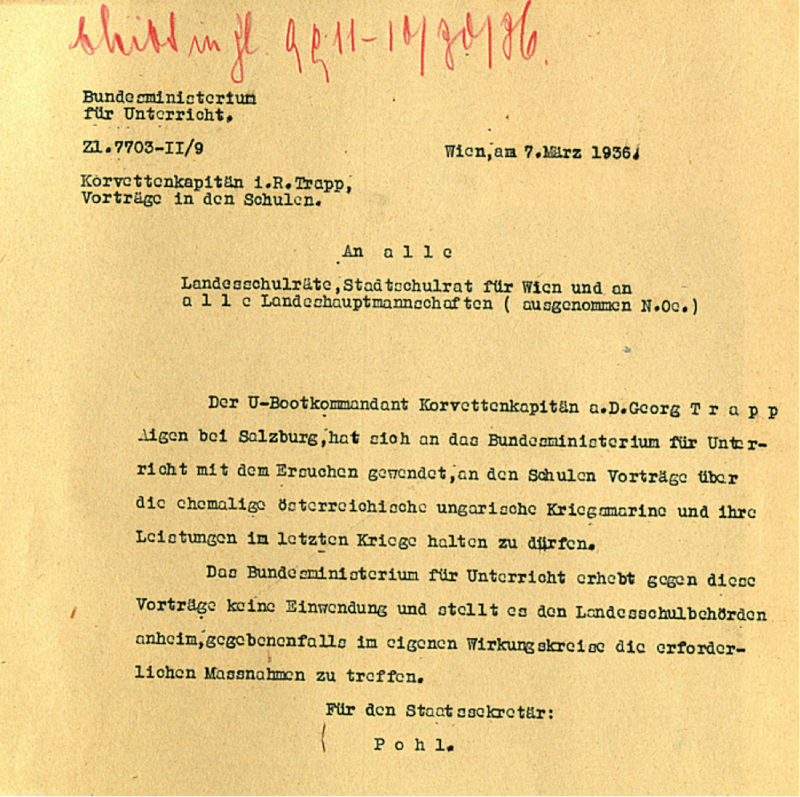 Firstly, in a letter dated 12 January 1935, we learn that he has been nominated as Gauehrenarbeitsführer – certainly some indication of a high degree of political loyalty to the Nazi state, over and above his status as a civil servant. He is also heavily involved with organising the forthcoming Winter Olympics in Garmisch-Partenkirchen – something which later leads him to send a press release to the Headmaster of the American school where Reinhard spends several months as an exchange student (Tabor Academy in Massachusetts). The content of this missive may or may not have had some small role to play in persuading U.S public opinion of the rightness of sending teams to the Berlin and Garmisch-Partenkirchen Olympic Games, despite suspicion of Nazi atrocities. 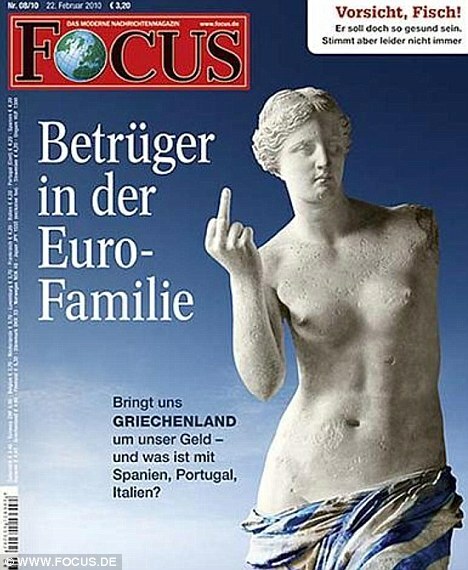 Pfundtner isn’t just a family man with four sons, who signs off his letters “your loving father”, and ticks Reinhard off for spending his pocket money too quickly. He is also one of the key architects of the Nuremberg Laws, which demoted Jews and Gypsies to a pariah status within Nazi Germany, and which were instrumental in the genesis of the Holocaust. This damning ambiguity in historical actors’ personal lives is one of the things which any historian of the Third Reich has to deal with on a daily basis. Still, that doesn’t make it any easier to reconcile two such conflicting images – the Schreibtischtäter, the murderer at his desk, formulating the laws which destined whole “races” to persecution and death – and the harassed, sometimes stern, but ultimately affectionate father. Is this the banality of evil? Or something far less iconic? Ancient Spartans and 17th-century harpsichordists: What’s the connection? My friend (and fellow baroque musician) John McKean and I have recently been having fun trying to find aptly idiosyncratic translations for some of the prefaces to 17th-century German treatises on harpsichord-playing which he’s analysing for his PhD. The amount of vitriol which these keyboardists were prepared to expend on their rivals – and the mordant wit with which they plunge in their poisoned rhetorical daggers – has to be seen to be believed. 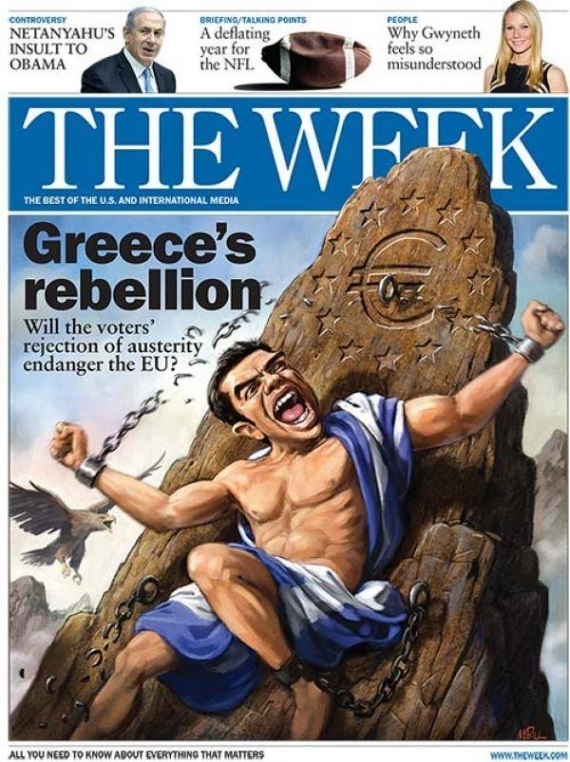 However, as someone who has always been incredibly interested in the reception of Sparta in the modern world (viz. 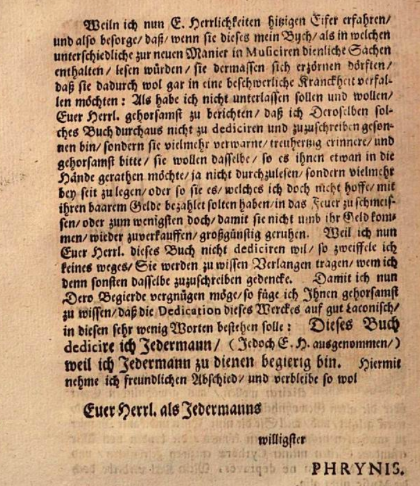 my own PhD thesis), I was literally left speechless for a few moments when John showed me the following extract from the preface to Wolfgang Caspar Printz’s Satyrischer Komponist, first published in 1677. Printz, writing under the pseudonym “Phrynis of Mytilene”, addresses the dedication of his volume to one Herr Emerepes, the ‘well-cultivated and gravely-hated Ephor of the famed city of Sparta’. The entire two pages which follow constitute a sustained attack on the old-fashioned, fuddy-duddy mores of this pseudo-“Emerepes”, and conclude by dedicating the book to every man living – apart from ‘His Lordship’, Emerepes himself. So, how to tease out this rich tangle of allusions? It seems that Phrynis of Mytilene – along with other key figures such as Euripides – was the leading exponent of a new, modernising movement in art and music which began to gain ground in the years before Sparta’s crushing victory over Athens in the Peloponnesian War in 404 B.C. The musical world apparently became more professionalised, and innovations in form, expression, melody, rhythm and chromaticism became de rigueur. For Printz, the reigning style of composition and playing represents a Spartan-style tyranny which is trampling upon his newfound creative freedom. 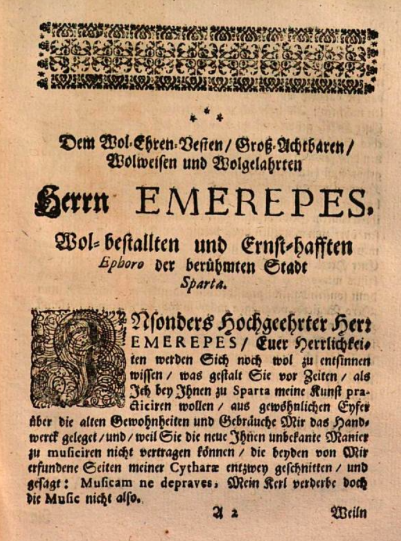 It’s hard to know whether Emerepes is envisaged as the avatar of a specific detractor, or merely represents all of Printz’s musical enemies, but in any event, he stands for the old, the philistine, the stick-in-the-mud critic, whose anger at Printz’s innovations may even end in apoplexy (my gloss for the ‘troublesome illness’ he mentions). So, it’s for this reason that “Phrynis” turns his dedication around, declaring that he would rather dedicate his work to anyone in the world but “Emerepes”. Instead, he instructs him to sell the book on, or even throw it on the fire, rather than trying to read it through, if it should come into his hands. Printz has more confidence that the rest of humanity will have understanding for his new, experimental ideas about style and musical mores. Thus, in ‘true laconic fashion’, in as few words as possible, he dedicates his book to ‘Everyman’, whom he is ‘eager to serve’. 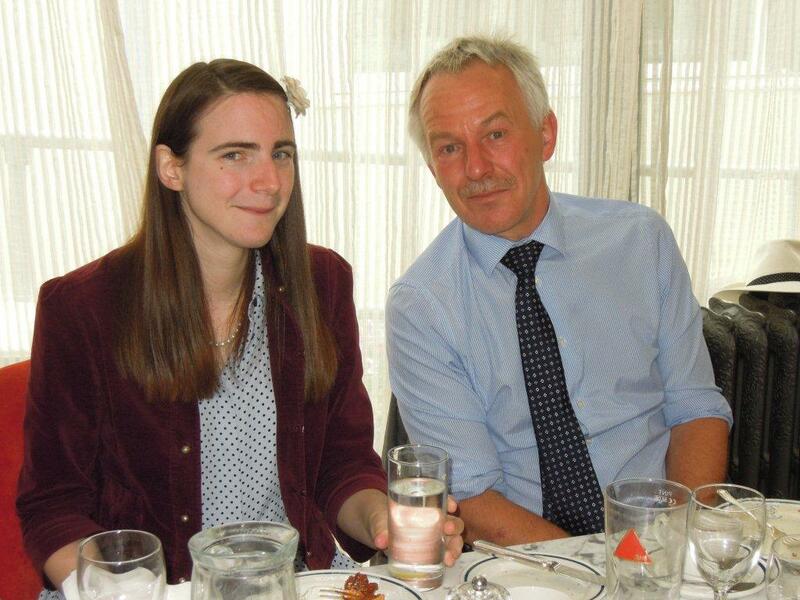 I was recently invited to give a lunchtime lecture to the Rotary Club of Cambridge, which took place on 7 July this year. I decided to take this opportunity to talk about my research on the exchange programmes which were organised during the 1930s between British public schools and the Napolas (the Nazi elite-schools which I’ve been working on for the past few years). 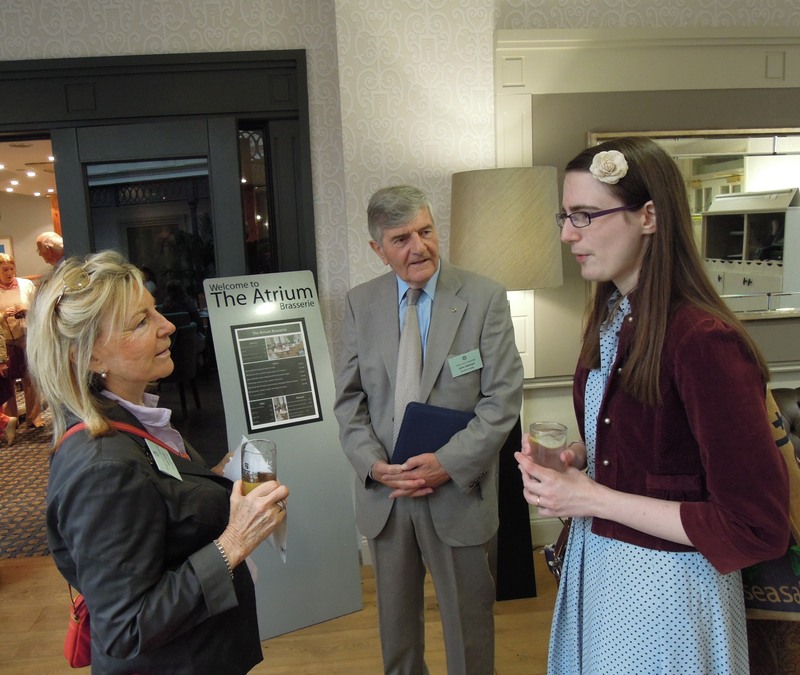 “Under the heading ‘Nazis at the Leys’, Dr Helen Roche, a Research Fellow at Lucy Cavendish College, gave us a fascinating and detailed description of exchange visits between English public schools and their German counterparts during the 1930s. The German National Political Education Institutes, NAPOLAS, were aimed at training the future Nazi elite in all walks of life. Unlike our own public schools, they were open to boys of all backgrounds and offered a generous scheme of free or heavily subsidised places. One of the attractions they offered was the opportunity of foreign travel, and it was on this basis that the exchange visits were founded. The impetus for these visits was enthusiastically endorsed on both sides. The German authorities had for some time admired the English model, and were keen to discover how the public school system could help their own educational techniques. We were similarly eager to discover any advantages that could be obtained by adopting German methods. 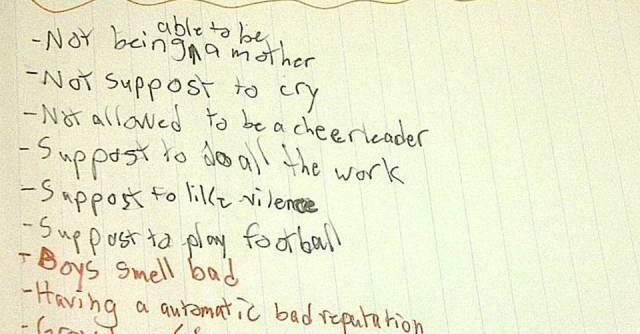 Additionally it was hoped that social interaction between boys who might become national leaders would help future political relations. 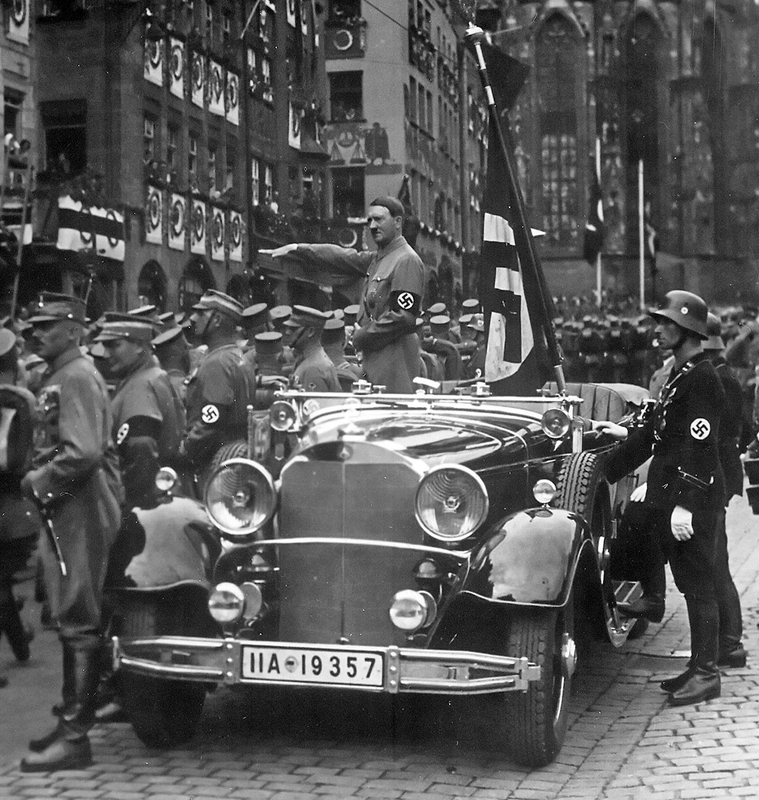 In May 1936, a group from NAPOLA Naumburg, near Weimar, visited the Leys. An article in the Leys school magazine described a friendly and boisterous raid on the Leys dormitories. The parting words were not ‘Auf Wiedersehen’ but ‘Auf Wiederfechten’, until we fight again. How prescient! Helen gave other illustrations of contacts between different schools such as NAPOLA Ilfeld and Kingswood School in Bath, whose magazine reported their visit in glowing terms. Exchanges and sporting tournaments between NAPOLAS and other public schools like Eton, Harrow, and Winchester, and many others were widespread. Unfortunately, the passage of time, and the highly political aims of the NAPOLAS, overshadowed the individual friendships that could have been forged between the boys had they been left to their own devices. 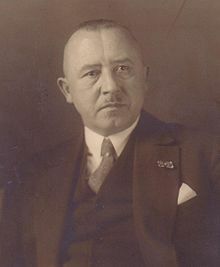 The final exchange between Ilfeld and Kingswood took place in July 1939, when attempts to downplay tensions were made. A hope that ‘May the bonds of friendship be stronger than political tensions’, expressed by a German visitor, was not to be fulfilled. When I first realised that I would have to visit over fifty archives in Germany and Austria in order to complete my current research project, I did fall prey to certain misgivings. Intimate acquaintance with the intricacies of regional public transport networks all over Germany would surely prove the least of my worries – what of the archives themselves, each with its very particular set of rules and regulations, unwitting violation of which might easily cast a foreign researcher into outer darkness? Take the Austrian State Archives, for instance, with their implacable and inalienable rule that each researcher may only order a maximum of three boxes per day. Admittedly, the boxes are fairly large, but if one knows what one is looking for, they can still be polished off fairly expeditiously. In desperation, towards the end of my month-long sojourn in Vienna, I therefore inveigled my husband into accompanying me, buying a weekly ticket and sitting there working on his latest opera-libretto, whilst I worked through “his” three boxes at a frantic pace (needless to say, only the person who has ordered a box can collect or return it…!). Only then could I release him, and embark upon my own daily quota. Then there are the long-term inhabitants of the archives, whose habits repay careful (and sometimes wary) attention – the archivists themselves. These can range from the “characters” on the desk at the German Federal Archives in Berlin – the grumpy East-Berliner who bawls out any scholar who dares to put their microfilms away improperly, and the acerbic receptionist who refuses even to talk to a researcher who has forgotten to place their handbag (however small it may be) in the locker-room – to the enchantingly friendly denizens of the recently- founded Zentralarchiv des Bezirksverbands Pfalz in Kaiserslautern, where one is permitted to take bags inside (shock horror! ), make free photocopies on the scanner-printer in the Director’s office, or even have tea and sandwiches with his assistant in the reading-room itself. Every archive certainly has its foibles: the Political Archive of the German Foreign Office, for instance, subjects all its visitors to a full airport-style security check before they enter – yet, once inside, the researcher is given a rare privilege indeed: permission to photograph documents indiscriminately at no extra cost (as opposed to the average, exorbitant charge of 50 cents per photocopy). Meanwhile, if you are filling out registration forms at the Bavarian State Archives, beware the little box marked volljährig – if you forget to tick it, you will have inadvertently declared yourself to be “under- age”, and risk the ignominy of being mistaken for a precocious teenager, at least in jest. Even the names of the archival search-engines often betray a certain classicizing charm: INVENIO, ARGUS, or VERA, to name but a few. But that’s nothing compared to the occasional random gems about whose existence these very databases would never think to inform you: propaganda pamphlets from the 1920s railing against the rise of Sunday shopping in rhyming verses of surpassing kitsch; advertisements for a purveyor of smoked meats sporting a strangely appealing little piglet made of sausages and salami (pictured above), or even the fulminations of General Jodl of the Wehrmacht High Command in June 1941, decrying the flagrant and unnecessary use of ‘primitive’ or ‘barbarian’ acronyms – including Stalag and Stuka. So, in the end, the idea of spending eight months travelling to those fifty or so archives turned out to be rather more daunting than the reality, which was always leavened both by these moments of incidental humour, by the kindness and helpfulness of most of the archivists whom I encountered – and, ultimately, by the thrill of the chase. 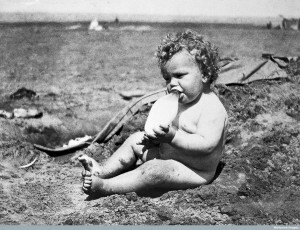 This post was originally written for the University of Cambridge History Faculty newsletter.